Anne had all the riders knot their reins halfway up the neck and hold the reins just in front of the knot. “The arms are a continuation of the reins, 5 to 5 ½ inches apart, like the horses mouth. Like a bit,” she said. 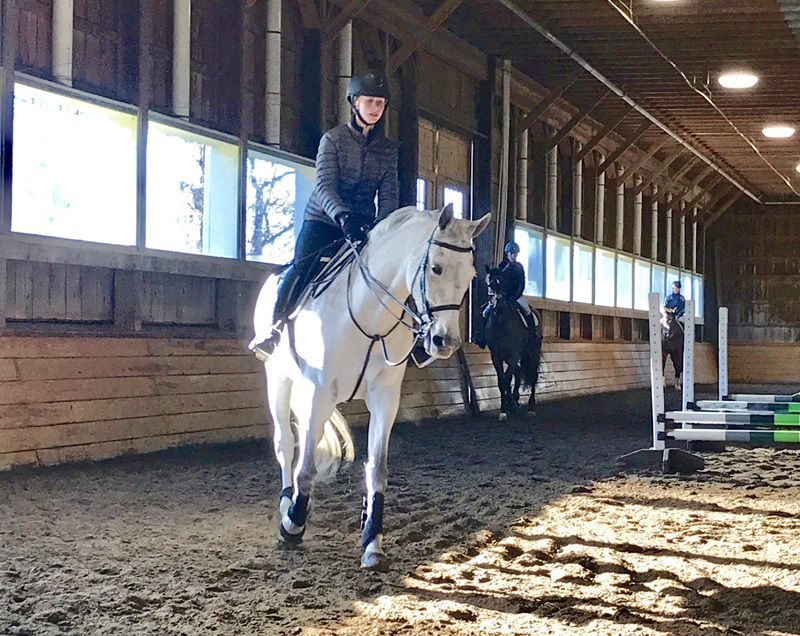 When a couple of riders were having difficulty with their horses accepting the contact, Anne hopped on. She said, “The first thing I do is move them off my leg. After the lateral work, nine times out of 10, horses put their head down because their back is coming up. 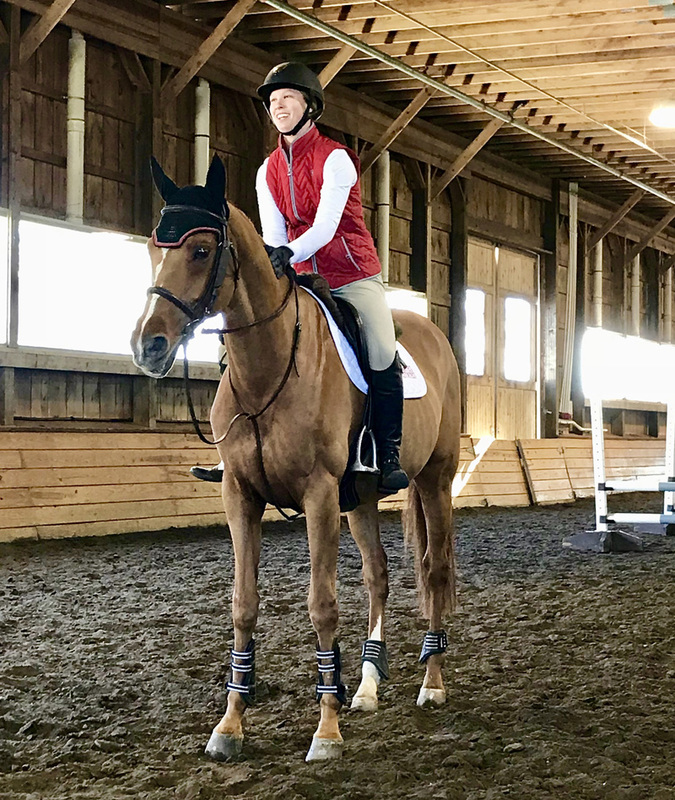 No draw reins, no gimmicks, just the inside leg to the outside rein.” The horses gradually raised their backs and softened through the poll and neck. The first jumping exercise was a cross rail, 18’ to an oxer, 19’ to a vertical, and 31’ to another oxer. After they landed from the last jump, riders had to drop their stirrups, and halt on a straight line. Riders started with just the cross rail and gradually added in the rest of the gymnastic. 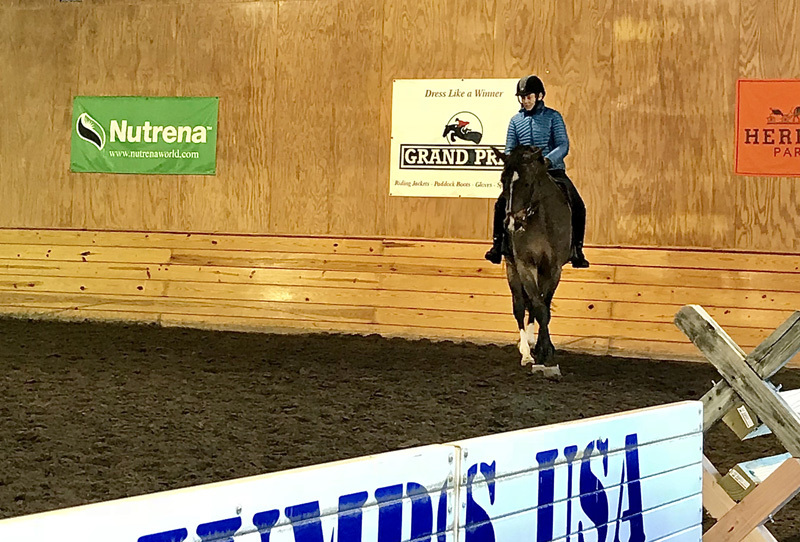 Anne had the riders two point in, canter out and emphasized straightness and riders staying over their horses through the exercise. Again, riders knotted their reins and jumped through the exercise. The second exercise was a bounce exercise. Anne set two low verticals with 10′ in between, then 31′ or three strides, to three low verticals with 10′ in between them. She had the first two groups work staying in their two-point position and letting their horses figure out the fences. The third group used driving reins (holding the reins with the hands upside down) with wide hands to keep their upper body still and stay close to the horse. 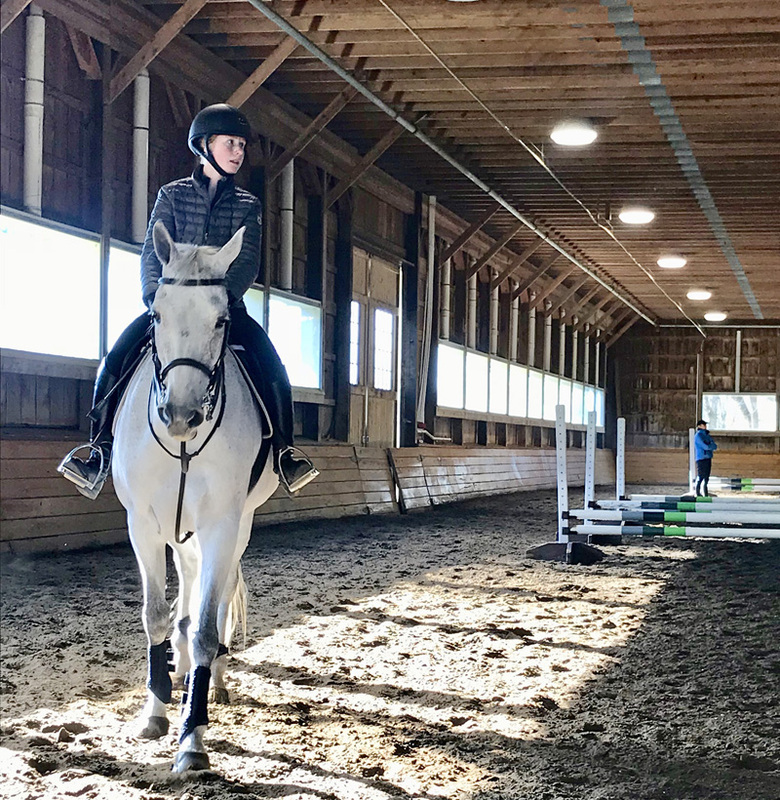 When asked what the riders learned on the first day, many replied that they realized that they didn’t need to be so busy with their hands, they needed to be more physically fit and that they could alter their position slightly to be more effective on their horses. Want more? Read Day 2: Clear Communication Is Key and Day 3: Get It Done. Finish Line live streamed the advanced section of the Nov. 17-19 clinic at www.ridingandjumpingmentor.com live stream will also be available on demand.